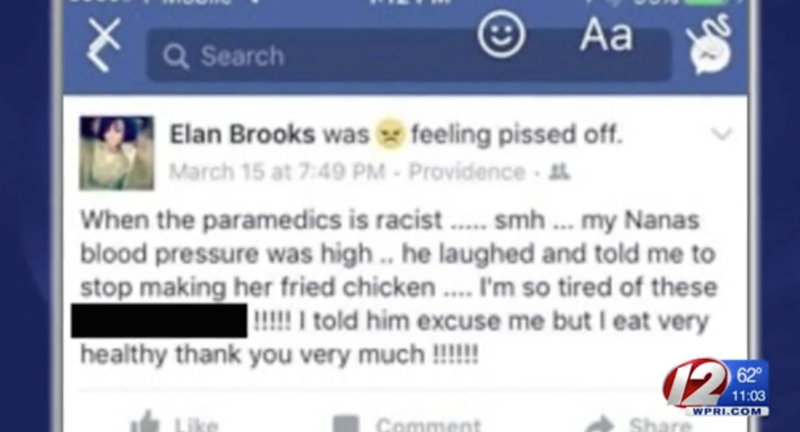 Andre Ferro, a Rhode Island firefighter, has been fired for making racist remarks to an elderly black woman after responding to a medical call. The Providence Journal reports that Ferro was responding to a call to assist an elderly African-American woman suffering from consistent nosebleeds. While the other firefighters attended to the nosebleed, Ferro made a comment, saying that the woman should “stop eating fried chicken.” According to the report, there was “no fried food or fried food smell” in the apartment. Steven Pare, Providence’s public safety commissioner, says that he began to investigate Ferro’s behavior after seeing a Facebook post by the woman’s granddaughter, who was outraged by the racist remark. Ferro admitted to Pare that he did make the comment, but said that “he made the comment in the context of other types of foods to avoid, such as cheese, bacon and burritos,” WRPI reports. “After considering his previous disciplinary history, Ferro’s conduct of March 15, 2017 and the context in which it arose and the potential damage to the reputation of the Providence Fire Department as a result of firefighter Ferro’s conduct, the board find only appropriate penalty to be imposed is termination,” the Fire Department Trial Board wrote in its 2-1 decision. Ferro was terminated once before in 2008 for verbally harassing a female firefighter; he was later reinstated on appeal. Read more at the Providence Journal and WRPI.